Nanonics provides the most comprehensive range of unique SPM, NSOM or SNOM systems available today. NSOM (SNOM) systems for transmission, collection and true reflection NSOM imaging are available. 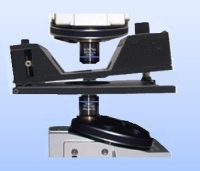 All our systems both AFM and NSOM provide for a completely free optical axis from both above and below, thus allowing for transparent SPM integration with standard optical microscopes both upright, inverted and unique dual (or 4pi) microcopes. Electron microscopes are a driving force in the nanotechnological revolution. Atomic force microscopy along with scanning tunneling microscopy is another enabling technology in the growing field of nanotechnology. These two worlds, although highly complementary, have generally been separate and apart. For the first time ever, Nanonics Imaging Ltd, in its drive for integrated microscopic solutions has now been able to fully and transparently integrate these two worlds. The Cryoview enables measurements of low temperature electrical, optical, magnetic, and thermal properties of materials fully integrated with near-field and far-field optics, Raman, and fluorescence spectroscopies. It opens new avenues for multiprobe measurements including transport properties of materials at temperatures as low as 10K. The CryoView is an award-winning, must-have tool especially suited to probe 2D materials such as graphene, MoS2, BN, TaS2, NBSe2, WS2, HfO2, metamaterials, and metasurfaces as well as other functional material materials such as Si, carbon nanotubes, III-V semiconductors, and quantum dots. Many of these materials with their associated properties require a wide variety of physical phenomena that must be applied for a full functional understanding. Examples include: nanometric photoconductivity and other optically related properties, nano electrical characteristics (electronic mobility, charge carriers, etc. ), thermal properties, and quantum Hall effect. All these phenomena can be investigated using apertured and scattering modes of NSOM and sSNOM and/or Kelvin probe, which are often coupled with Raman chemical characterization and other optical spectroscopies such as photoluminescence. Up to 4 probes are possible with the CryoView MP where each probe is capable of all SPM modes including magnetic force microscopy (MFM), electrostatic force microscopy (EFM), Kelvin probe force microscopy (KPFM) for low temperature operation. These advanced modes are possible in addition to topography and morphology with non contact AFM based methods. Non-contact AFM is made possible through tuning fork actuation where the probe is mounted onto the tuning fork, and feedback is maintained by monitoring either the amplitude, phase or frequency . Any probe, including cantilevered probes, can be mounted onto the tuning fork for a full range of SPM capabilities at low temperature. 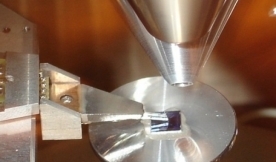 All AFM and STM probes are compatible with the CryoView MP. All probes in the CryoView MP have unobstructed access from above and below enabling full integration with optical microscopes and optical methods at low temperature. With selection of correct probes, AFM-Raman or NSOM can be performed with any of the probes in the system. The multiprobe design in the CryoView MP is uniquely suited for electrical, thermal, and optical transport studies. One probe can be used to excite or optically pump the sample, while a second probe can detect the results of the excitation. A third and fourth probe can be then be used for further study and characterization. Numerous examples of transport studies that can be studied with our multiprobe system can be found here including electrical transport on graphene with simultaneous Raman or simultaneous reading and writing of protein features on a sample. SPM Systems with more than one probe that can image independently have always been a dream.This dream has become a reality with the MultiView 4000™ with its AFM, NSOM and SPM multiprobe capabilites and it's optical and electron optical compatibility. Four probes operate simultaneously and independently, with each probe having its own feedback and scanning capabilities. Measure sophisticated properties only possible with the availability of multiple probes such as electrical, thermal and optical properties of devices. 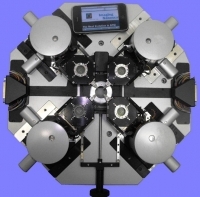 The MultiView 4000 is a novel platform containing multiple probes/AFMs for advanced experiments such as: nanoscale transport, optical pump-probe, and read-write experiments. The MV 4000 continues the tradition of the MV series, providing total optical flexibility and customization possibilities. Now, AFM Raman and Tip Enhanced Raman Spectroscopy (TERS) can be integrated with the multiprobe capability. In addition, free optical access from above allows easy visualization of all probes and facilitates nanomanipulation. 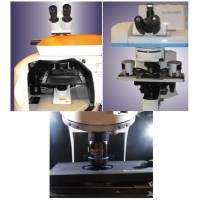 With the MultiView 2000™ series, Nanonics has reaffirmed its position as your complete supplier in this unique interface between scanned probe and optical microscopy. At Nanonics, both the optical microscope and the scanned probe imaging systems are given equal importance. No other manufacturer of scanned probe or optical microscopes can provide for such effective solutions in both these growing areas of imaging. The result is the ultimate degree of integration in imaging methodologies. The award winning MultiView 1000™ is the first system available that fully integrates all forms of scanned probe microscopy with conventional optical microscopy. Designed around Nanonics' patented, award winning 3D Flatscan™ scanner technology and incorporating sophisticated cantilevered optical fiber probes, the instrument can simply and transparently be combined with any inverted, upright, or dual optical microscope. Nanonics announce the release of the SpectraView MV2500, a breakthrough system combining complementary scattering techniques with Ultrasensitive AFM and SPM for Nano-Chemical Analysis. Read more below. Nanonics, the leading provider of cutting-edge AFM technology, is proud to present its newest breakthrough in bio atomic force microscopy: the Hydra BioAFMTM featuring VISTATM (Vivid Imaging Soft Touch AFM) mode. This innovation offers ultrasensitive single pN force mapping combined with the benefits of super-resolution optical/fluorescent imaging. Live cell imaging with <100nm optical resolution and direct correlation with AFM topography is now possible. The finest structures, such as microvilli, can now be analyzed with on-line mechanics. The Hydra BioAFM, with its single or multi-probe capability, allows versatile optical integration with dual microscopes & side illumination. The system enables super-resolution methods like STED, PALM, STORM, and live cell NSOM with any available dye.